The Hunger Games trilogy: How should it have ended? I finally finished all three books of the Hunger Games trilogy. I started reading the books last week, when classes were suspended for a week because of the monsoon. It’s fairly easy to finish the series if you really have time. You can even finish two books in one sitting, I think. Anyway, I can’t say I’m satisfied with how the story ended, then again, what ending could possibly make the entire essence of the trilogy palatable (for lack of a better term)? The very nature of the story – war, rebellion, violence, cruelty, the loss of innocence – makes having a ‘happy’ ending impossible. Such is the nature of war. Nobody really wins. It’s kind of depressing, actually. The way life turned out for Katniss, and how much different things might have been if Prim wasn’t chosen during the reaping (Suzanne Collins, the author, anticipated this and explores the same question as voiced through Katniss). There’s so many things needing resolution, but there’s none, and while some find this the ‘undoing’ of the series (mixed reviews), I actually think this is what makes the Hunger Games so compelling. I can’t think of a way to make the ending, or the story itself, ‘pleasing’ to everyone. Maybe our feelings on the ending, if we liked it or disliked it, reveal or somehow point to our personality, that is, if we are a realist, idealist, optimist, or cynic. I haven’t yet met a person who’s 100% happy with how the story ended. If anything, the recurring sentiment is that the book is downright depressing. Whatever it is, all these things, the what-ifs, the unanswered questions, the debates, discussions and mixed reviews, certainly make reading the Hunger Games worthy of your time. Heart pounding, adrenaline burning through me, everyone is my enemy. Except Gale. My hunting partner, the one person who has my back. “Thanks for the water,” Peeta says. “To make sure Katniss is still here?” asks Peeta. “Something like that,” Gale admits. “It was just part of the show,” Peeta tells him, although there’s an edge of doubt in his voice. Last year I made a list of books I want to read, and set a goal for myself to finish one book a week. Uhm. I think I will start a new set of book read-list this year. The most ironic thing about the past few months that I have been unemployed is that I have spent so little time reading, aside from the Bible*. When I was still working, I’d labor to get a few pages done, sometimes even fall asleep while reading. I think I only finished one book, cover to cover, which is Les Miserables, over the last couple of months (I finished it within a week). I loved the story. It spoke to me more than anything about the power of grace – of being shown grace, and how it compels one to respond through a changed life. Of course, I am not alien to this concept. Grace, among many other things, is the story of Jesus’ death and the salvation He offers. It makes me evaluate my life. Have I changed because of Jesus’ loving act of grace? I could be working again real soon, so I think I better catch up on my readings while I still have ‘more’ time. I am currently reading Crime and Punishment by Fyodor Dostoevsky. Funny thing is, I started reading this book I think sometime last year, October or November. This is waaay overdue. And it’s really not a book you’d like to read before going to bed. It’s like the book version of Criminal Minds. It delves into what goes on in the depraved mind of a man who plans and eventually commits a crime, and the rationalizations behind it. Hardly a relaxing night-time read. But, I love Doestoevsky’s works and when I love an author I usually read most of his books. That’s why I chose this. 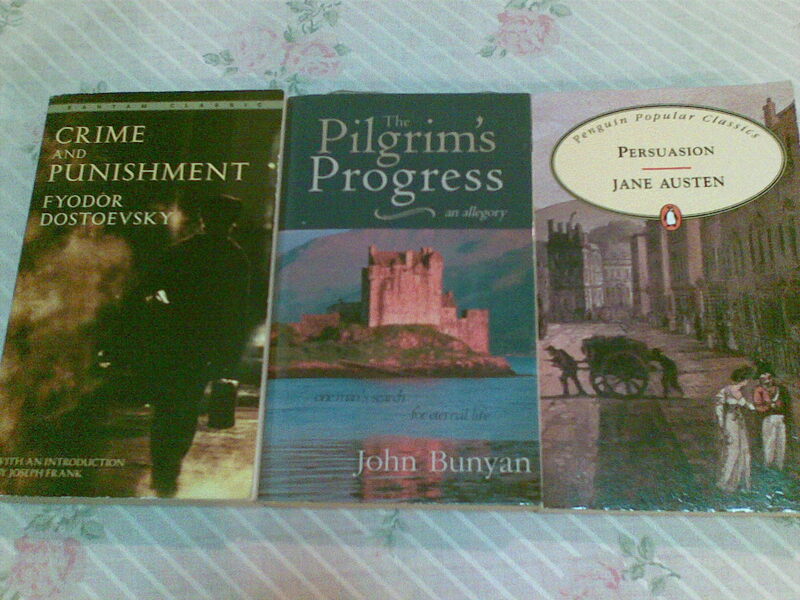 Another book that I bought a long time ago but still haven’t finished is Pilgrim’s Progress by John Bunyan. Still another one is Sense and Sensibility by Jane Austen. Just now, I saw on top of my table another Jane Austen classic, Persuasion. This is Kz’s book. I think I want to read this as well. I feel like there’s so many books and so little time! Okay. Gotta finish up now and start reading. Hopefully in my next book update, I have finished Crime and Punishment already. *I set a goal, again, to finish the Bible this year. So far, I am already in 1 Samuel. Compared to other years, I am doing much better, thank you very much! Hopefully I can be consistent!